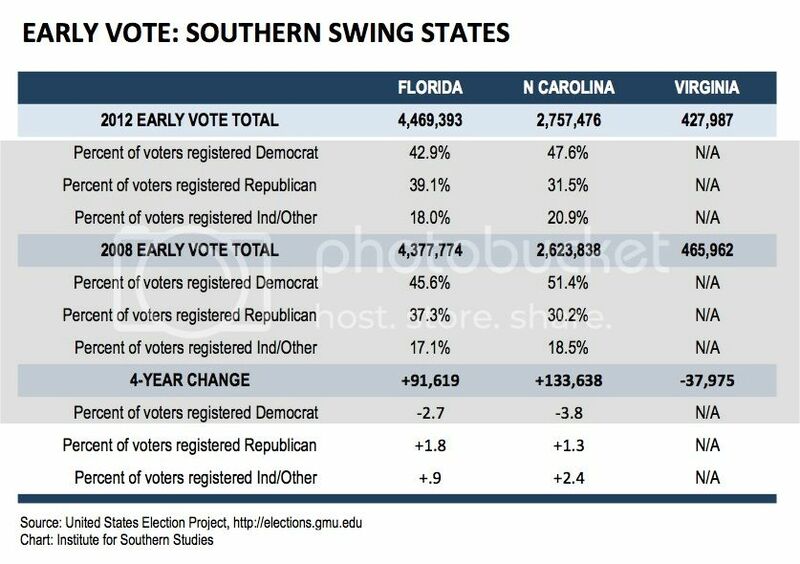 Heading into Election Day, more than 7.6 million voters in the three Southern swing states -- Florida, North Carolina and Virginia -- had already voted, taking advantage of early voting centers and absentee ballots. That's some 200,000 more than voted early in the three states in 2008, according to data collected by the United States Election Project at George Mason University. What do the early voting numbers tell us, if anything? There's good news for both Democrats and Republicans. Democrats can point to an early voting edge in both Florida and North Carolina. 42.9 percent of those who cast ballots early in North Carolina were Democrats, compared to 39.1 percent Republicans -- 3.8-point advantage. The remaining 18 percent were other or unaffiliated. In Florida, 47.6 percent of early voters were Democrats, compared to 31.5 percent for Republicans -- a more substantial 16.1-point spread. Nearly 21 percent identified as other or unaffiliated. But Republicans can claim victory, too. In 2008, the margins were much bigger for Democrats: Dems had an 8.3-point advantage in North Carolina in 2008, and a 21.2-point lead in Florida four years ago.